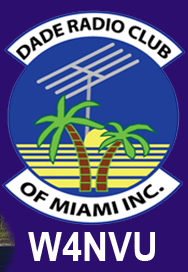 Miami – Dade RACES Procedures – W4NVU – Dade Radio Club of Miami Inc.
“Check-in Procedures if/when an Event with-in Miami Dade County”. 1) 146.700 PL tone 156.7 if this frequency is not operational use the Back-up frequency. At this time check to see if we have been activated to service. Keep checking into frequencies frequently and/or monitor the frequencies. B) There will be RACES Net control monitoring the frequency to let you know what, or if any information we may have at that time, or to advise you where you may be needed. C) We will make you aware of any short term or long term needs for amateur help . E) If the event is a Hurricane -36 hours before the storm- we will have a net controller available to start giving information out at the following times. 0700hrs, 1200hrs, and 1800hrs. 1) Will you and your family be riding out the storm at home? If so we will log you in as at your home. G) After the storm Contact net control to let us know if you are safe or in need of help. Please also inform us of the status of your neighborhood, or any other pertinent information. If we don’t hear from you we will send someone out to check on you to see if you are ok.
H) If you and your family are ok and you can take an assignment Please let net control know so we may place you where needed.